I recently posted on the phenomenon of grieving when a celebrity dies. We grieve because we have a connection to them, just as we do with our real friends. “I felt like I knew them” is a familiar explanation. 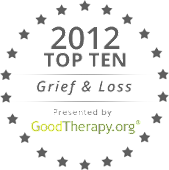 Aurora Winter’s article, Elizabeth Taylor: 5 Tips for Overcoming Grief When a Celebrity Dies, looks at this from the perspective of actress and AIDS activist Elizabeth Taylor’s recent death. She has some thought-provoking tips for using a celebrity’s death as a catalyst for your own life. I'm here from your sign up on the Blogging from A to Z Linky list. I presume you are participating in the event even though I don't see any mention of it on your blog. In any case, thank you for joining the roll of Blogging from A to Z. I have added myself to your followers. Lee, I didn't think I was supposed to put anything up until April 1, but I'll get it up sooner. Thanks for the reminder!